About - Paula's Midwifery - Paula Tipton-Healy, L.M. and Haley Kaijala, L.M. 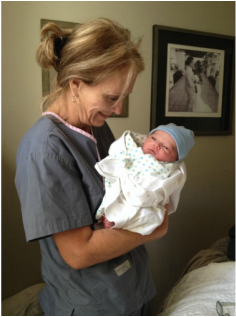 Paula Tipton-Healy has attended over 2,000 birth as a practicing homebirth midwife for over 30 years. She is licensed by the Medical Board of California, has a Bachelor of Science Degree in Nutrition, and holds a Certificate in Homeopathy. She has been a homeopathic and nutritional consultant for over 28 years. Paula has trained many apprentices and midwives over the last 30 years. She loves to teach and continues to speak on subjects that are near and dear to her, like pregnancy, birth and health. Paula's passion for health led her to create a line of products that support the digestive system. You can find those products and more information about gut health at her website www.DiverticulitisInfo.com. Paula is mother to four daughters, all born at home! Her absolute pride and joy is her grandson Ronin, who was also born at home! Paula practices Homeopathy at her office in Vista. She also has a out of hospital midwifery practice serving families in San Diego. Her midwifery office is located in Vista. ​To hear a blog interview about Paula visit here. ​Haley Kaijala has been attending births for the last five years. She has worked in home and birth centers through out that time. For the last two years she has studied under the incredible mentorship of Paula Tipton-Healy. She has worked with women and babies her whole adult life as a nanny and doula. She is dedicated to the empowerment of women through connection to and owner ship over their bodies. Haley is the mother of two daughters, both born in hospital. Each of her births taught her the importance of informed decision making and fueled her passion for providing evidence based empowering care. We are currently accepting new patients for both home and birth center! Please visit our contact page and we would be happy to schedule a free consult to discuss your pregnancy and birth options! ​Paula's Midwifery is dedicated to providing evidence based, inclusive care to all persons and families regardless of race, religion, gender expression, or sexuality.